Without giving up strength, the BOSS HTX V-plow is lightweight enough for many half-ton trucks, SUV vehicles, and even select Jeep Wrangler models. 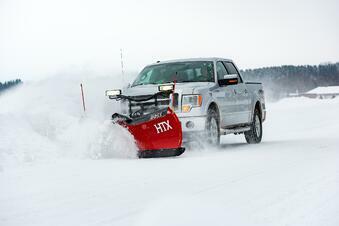 Weighing in at just 490 lbs., the HTX V-plow fits many more vehicle applications than heavier plows. To confirm recommended plows for your vehicle, use our Product Selector Tool. Like other BOSS v-plows, the HTX screams BOSS. The 7'6" Steel blade with the flared wing design made popular by BOSS to throw snow higher and farther is the same design used on XT and DXT models. Additionally, the BOSS red and SmartShield corrosion resistant powder coat finish featuring Zinc primer, deliver protection and a long-lasting high-gloss shine. The full moldboard trip design ensures the whole moldboard trips when obstacles are encountered. The HTX V-plow was created with the time-tested innovations that BOSS has created over the years. The latest innovation from BOSS is the SL3 L.E.D. headlights with up to 2x the light output when compared to traditional halogen systems. This 100% L.E.D. light system offers a fuller light pattern with lower power consumption and up to 8-10 years of bulb life giving you an edge on those night storms. SL3 L.E.D. 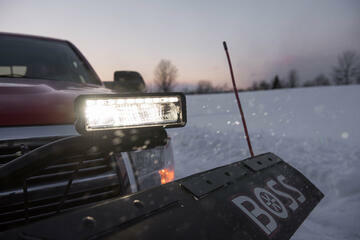 lights come standard on all new BOSS plow purchases. SmartLock angle cylinders hydraulically hold the cylinder in position when back dragging. These single acting cylinders only run the hydraulic system to extend the wings forward. To return the wings, wing return springs do the work. This is a much simpler design with less moving parts and less wear on the hydraulic system. The HTX V-plow cutting edge includes a snow catcher and curb guards in one, simple, easy to install design. The patented snow catcher is designed to catch snow at the plow's pivot point ensuring no mess is left behind. The reinforced moldboard with diagonal cross bracing and formed bottom channel increase the blade rigidity giving it all the strength you need to conquer the worst storm. To ensure the blade scrapes evenly, the HTX V-plow comes with a bumper stop adjustment on the back of the blade. This allows the operator to tilt the blade forward or backward keeping the cutting edge in contact with the plowing surface for clean scrapes. The enclosed hydraulics present corrosion and hydraulic freeze-up to deliver speed and reliability. HTX V-plows come standard with a built in show bracket making installing plow shoes much easier and faster. Keep in mind plow shoes are optional! Pre-punched holes at the top of the plow were also made standard for quicker and easier installation of snow deflectors. By adding this shoe bracket and pre-punched snow deflector holes, adding accessories is a simple process. This V-plow stands out from the crowd and ensures your half-ton truck or lighter duty vehicle can be a real winter workhorse. Whether you are a homeowner who needs a plow to clear long driveways or camp roads or a contractor with a few accounts looking to put your half-ton truck to use, the HTX V-plow is sure to get the job done. For additional information on the HTX V-plow click here.